Free Printable May 2015 Calendar. 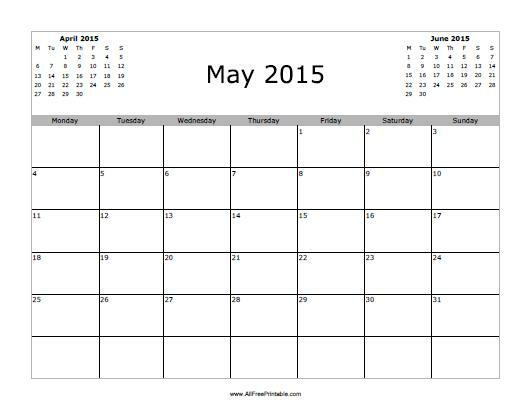 Free Printable May 2015 Calendar with the previous and next month. Great printable calendar to use as a planner for the office, school, clubs, small business or for parents. Save money, don’t buy calendars just print all free. Print the free May 2015 calendar using your inkjet or laser printer and write down special events and things you don’t want to forget this month. Remember important days like a job interview, college test, graduation, trip planning, Mother’s Day, sales event, things to do and more. Select from the free printable May 2015 calendar starting the week on Monday or Sunday.